Heavy rain arrives Thursday morning along with gusty winds upwards of 50 mph. Fasten your "Weather Seat-Belt" it's gonna be a bumpy ride over the next 2 days ahead. If you like rain we got it. How about a taste of Spring, we got that too. Guess what, we finish it off with gusty wind over 40 mph and a drop back into the "Arctic Freezer" . Wednesday kicks off the "Weather Roller Coaster" affair on a dry note. Clouds will steadily increase throughout the day with rain showers arriving somewhere around the evening rush. Temperatures will start in the 20s but look to climb into the 40s as our warm front starts to push in from the south. The heaviest rain still remains west and looks to hold off until the overnight hours. As a result Flood Watches are in place for much of Maryland with the exception of the Eastern Shore Thursday morning into Thursday midday. 1-1.5" of rain is likley to fall pretty quickly on frozen ground below leading to excess runoff for flooding concerns. As the warm front comes north winds will pick up out of south and southwest gusting to 30 mph. Higher gusts though look to arrive as the cold front pushes east early Thursday morning. This is where we look to see the heaviest rain, temperatures near 60 degrees, and even a rumble of thunder. As the front passes winds could easily topple 40 mph in Baltimore with 60 mph gusts down along the coast in Ocean City. 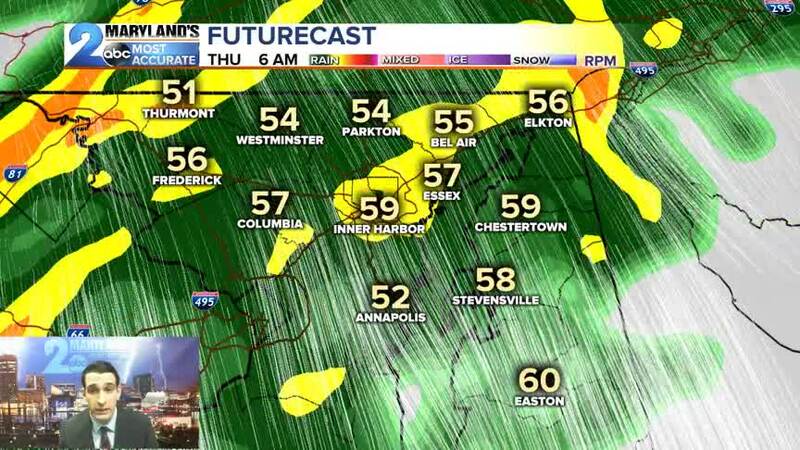 For that reason a Wind Advisory has been posted for much of Central Maryland and the Eastern Shore through the first half of your Thursday. Rainfall amounts will be around 1-2" leaving the concern of localized flooding due to the frozen ground below and recent snowfall of the past few weeks. The storm system quickly departs Thursday mid afternoon as temperatures start to fall back into the 30s. Even colder air arrives for the weekend ahead but at least it is dry. Our next "Weather-Maker" doesn't arrive until the beginning of next week.